Whether you’re chatting by a fire pit on a campsite or spending a night in the backyard with tents and sleeping bags, sharing a meal over a campfire is a surefire way to make lasting memories with your family and friends. Make your outdoor adventure memorable with our campfire recipes that will satisfy your hungry loved ones – all of which are quick to whip up, so you won’t miss a moment of the fun. Smoked Sausage Kabobs are a fun way to create a quick and tasty meal to keep your campers happy. 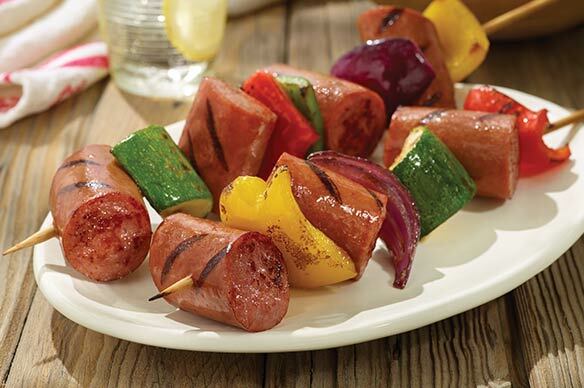 All you need are skewers, veggies and your favorite Eckrich Smoked Sausage! Pro Tip: Looking for a sweet treat? Chop pineapple, peaches or other fruit and place on skewers. Then, glaze with honey and grill. Try out our Smoked Sausage-Pineapple Skewers for a sweet and savory combo. This one-dish meal will make cooking easy and clean up a breeze. 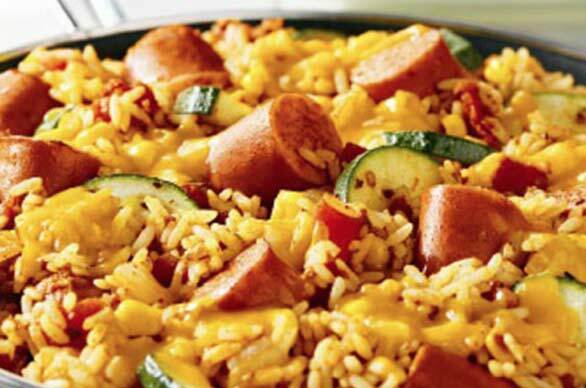 With rice, hearty veggies, your favorite Eckrich Smoked Sausage and loads of cheddar cheese, the Southwest Sausage Skillet Supper is sure to satisfy your hungry campers. Pro Tip: While your cast iron skillet is still hot, scrape off any food remnants. When the pan is still warm but cool to touch, use a paper towel to clean the pan with oil and kosher salt. Avoid using soap or harsh scrubs on cast iron skillets, or you may lose the pan’s seasoning that you’ve worked so hard to develop! 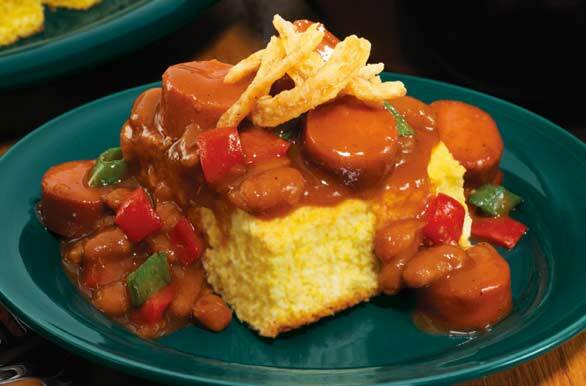 This twist on a classic combo combines cornbread, bell peppers, beans and BBQ sauce for a filling meal that you can prepare on the grill or in a skillet over the fire in no time. Get the full recipe. Pro Tip: Wondering how to build a fire? You’ll need tinder (for example, dry leaves), kindling (small sticks) and firewood (large pieces of wood). Always check with your local fire department or the campground officials to make sure you’re following all appropriate laws. Give the night a fresh taste with this tasty skewer sandwich recipe that calls for an Italian dressing glaze. 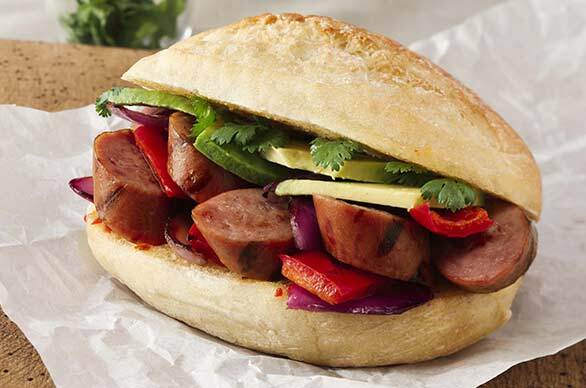 Try Eckrich Jalapeno & Cheddar Smoked Sausage Links for your campers who like a bit more kick. Pro Tip: Soak wooden skewers in water for 30 minutes prior to cooking to prevent them from burning. Stargazing and storytelling have you hungry again? 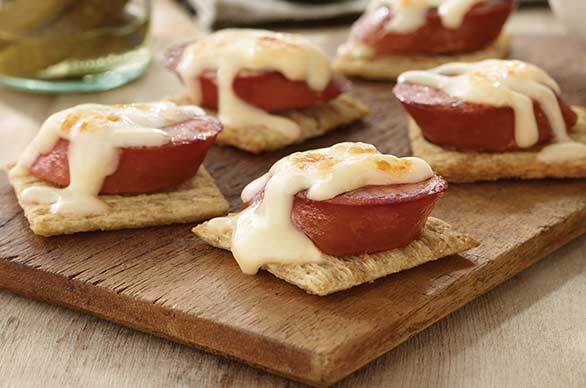 Grab your skillet, some cheese and crackers and grill your favorite Eckrich Smoked Sausage. Serve up this easy-to-eat snack, and keep the fun going. Pro Tip: Be sure to use a fire pit, fire ring, grill or fireplace for your campfire – especially when visiting a campground. This will contain the fire, keeping your family and the woods safe. Or you can create a ring out of larger rocks to create a fire pit. Get everyone in on the search for the best rocks! The great outdoors calls for great flavor. 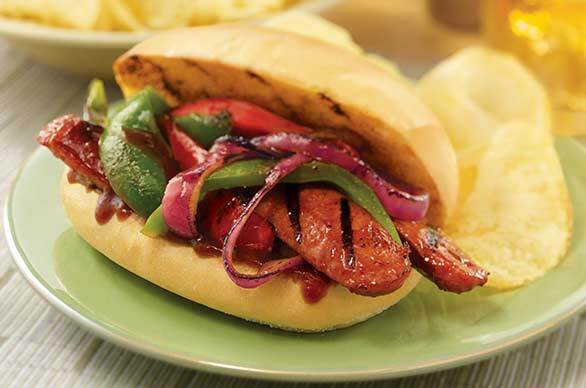 With bell peppers, red onion, spicy barbecue sauce and Eckrich Smoked Sausage, your campfire will be lit up with smiling faces after eating this flavorful sandwich. Pro Tip: Make sure to extinguish your fire with water, and keep some on hand in case it gets unexpectedly out of control. And don’t leave your campfire until it’s cool. Hold the back of your hand near the ashes. Still feel some heat? Don’t leave just yet. Add water and stir the embers until it’s cool. See more campfire safety tips from the USDA Forest Service. Be sure to take plenty of pictures and share them with us on Facebook. We’d love to see your campfire creations and hear all about your outdoor adventures!